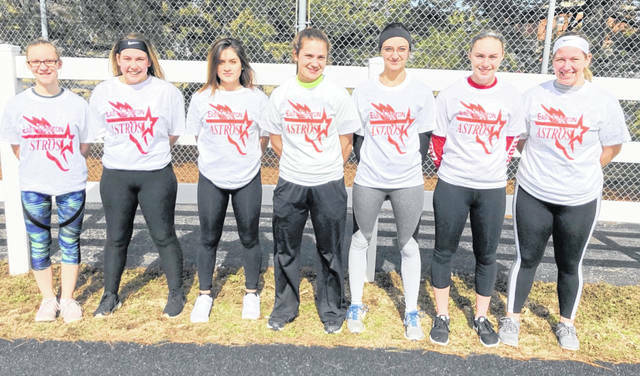 East Clinton High School girls track and field participants Braylynn Malone, Madison Cox, Aurora Lopez, Emma Malone, Brittney Wheeler, Mackenzie Campbell, Rhylee Luttrell. East Clinton girls track and field coach Michael Fritz is excited about the prospects of a strong season for the Lady Astros. East Clinton was sixth in the SBAAC last season and has the smallest squad in Fritz’s six years as head coach. But he says this may be the most talented collection of athletes he’s had in Lees Creek. Emma Malone, Brittney Wheeler, Rhylee Luttrell, Paige Bowman and Alexandria Hughes all finished in the top six in the SBAAC last season in various events. Newcomers Carah Antek, Myah Antek, Mackenzie Campbell and Madison Cox will contribute, Fritz said. Blanchester is the league favorite, Fritz said. His squad can contend for the title if it can stay injury-free.